Papercrafts by Patti: Sneak Peek!! 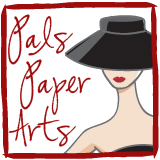 Please visit tomorrow and see how YOU can play along with Pals Paper Arts this week! We'd love to see how you use our inspiration for your card or project! You have me intrigued with this peek, Patti! I can't wait for the reveal! Have a blessed Thanksgiving, Pal!